Any independent variable, to be of value from a forecasting perspective, must be a leading indicator. For example, if the weather service or the Farmer's Almanac predicts that next winter is going to have an abnormally large number of snow terms, people would probably go out and buy snow shovels and snow blowers in the fall. Thus. the weather prediction or the Fanner's Almanac is said to be a leading indicator of the sale of snow shovels and snow blowers. These relationships between variables can be viewed as causal relationships-the occurrence of one event causes or influences the occurrence of the other. Running out of gas while driving down a highway. however, does not provide useful data to forecast that the car will stop. The car will stop. of course, but we would like to know enough in advance in order. to do something about it. A "low gas lever' warning light, for example. is a good leading indicator that forecasts that the car will stop shortly. The first step in causal relationship forecasting is to identify those occurrences that are really the causes of the change. Often 'leading indicators are not causal relationships but in some indirect way may suggest that some other things might happen. Other noncausal relationships just seem to exist a a coincidence. One tudy Some years ago showed that the amount of alcohol sold in Sweden was directly proportional to teacl crs' salaries. Presumably this was a spurious or non causal relationship. The following problem illustrates one example of how a forecast is developed using a causal relationship. 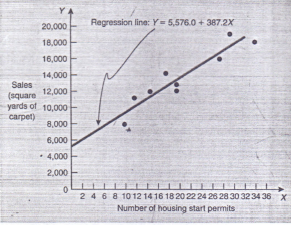 Example The Carpet City Store has kept records of its sales (in square yards) each year, along with the number of permits that were issued for new houses in its area. Carpet City's operations manager believes that forecasting carpet sales is possible if the number of new housing permits is known for that year. In this problem, the lag between filing the permit with the appropriate agency and the new homeowner coming to Carpet City to buy carpet makes a causal relationship feasible for forecasting.